Favorite: New Mexico State. The Aggies are the best offensive team, best defensive team, best overall shooting team, best shot-blocking team and by far the biggest team in the conference. Although they lost four WAC contests, all of those came on the road. 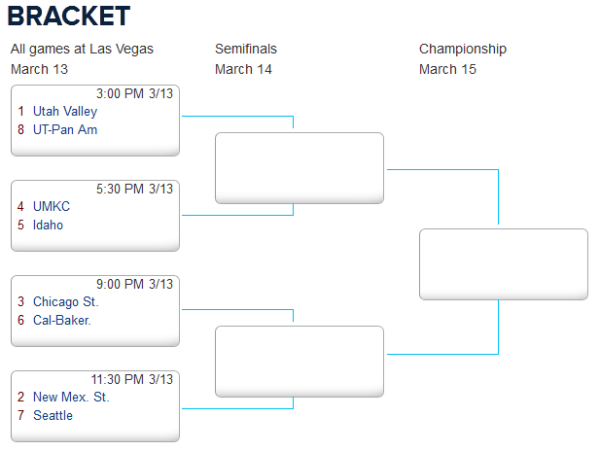 This tournament is played on a neutral floor, so Utah Valley – the top seed and NMSU’s likeliest threat – will not have home court advantage this time around. Darkhorse: Idaho. While it’s highly unlikely that Idaho will leave Las Vegas as champions, it does have one of the league’s best players in Stephen Madison and it did knock off NMSU at home back in February. The Vandals and Aggies are on opposite sides of the bracket, so a trip to the finals is quite possible. Then, who knows? Who wins: New Mexico State. One has to wonder if motivation was a factor at times this season for the Aggies, considering how many prognosticators assumed they would cakewalk to another WAC title. With everything at stake this weekend, expect NMSU to wake up and assert its dominance. Player to Watch: Stephen Madison – Idaho. The Vandals would probably have finished closer to the bottom of the pack if not for Madison. He leads the conference in scoring at about 20 points per game, rips down 7.6 rebounds a night, and gets to the free throw line at a high rate. The senior forward went for 24 points and eight boards in the team’s upset victory over NMSU. If Idaho makes any kind of darkhorse run this week, Madison will lead the charge. Of course, Aggies center Sim Bhullar, the 7’5’’ rim-protector to end all rim-protectors, will also be worth checking out. This entry was posted on Thursday, March 13th, 2014 at 9:01 am by Tommy Lemoine	and is filed under microsites, other 26. Tagged: idaho, k.c. ross-miller, marvin menzies, new mexico state, orleans arena, Sim Bhuller, utah valley, wac, wac tournament. You can follow any responses to this entry through the RSS 2.0 feed. You can leave a response, or trackback from your own site.